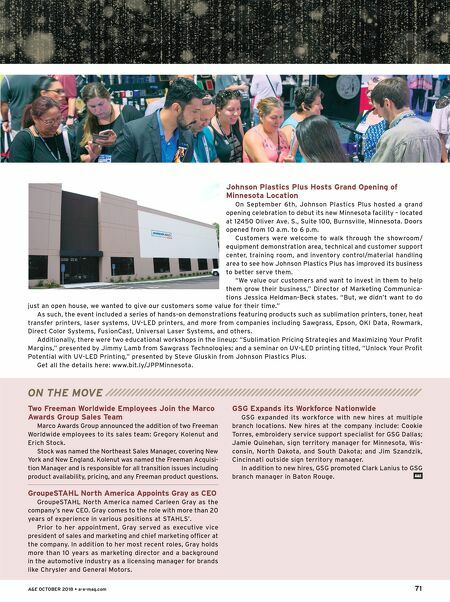 A&E OCTOBER 2018 • a-e-mag.com 71 Johnson Plastics Plus Hosts Grand Opening of Minnesota Location On September 6th, Johnson Plastics Plus hosted a grand opening celebration to debut its new Minnesota facility – located at 12450 Oliver Ave. S., Suite 100, Burnsville, Minnesota. Doors opened from 10 a.m. to 6 p.m. Customers were welcome to walk through the showroom/ equipment demonstration area, technical and customer support center, training room, and inventory control/material handling area to see how Johnson Plastics Plus has improved its business to better serve them. "We value our customers and want to invest in them to help them grow their business," Director of Marketing Communica- tions Jessica Heldman-Beck states. 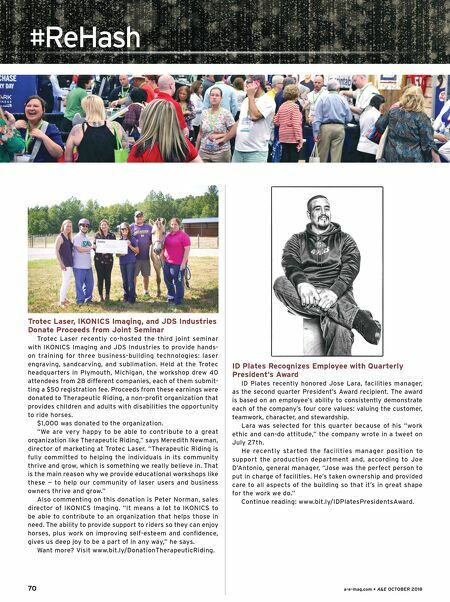 "But, we didn't want to do just an open house, we wanted to give our customers some value for their time." As such, the event included a series of hands-on demonstrations featuring products such as sublimation printers, toner, heat transfer printers, laser systems, UV-LED printers, and more from companies including Sawgrass, Epson, OKI Data, Rowmark, Direct Color Systems, FusionCast, Universal Laser Systems, and others. Additionally, there were two educational workshops in the lineup: "Sublimation Pricing Strategies and Maximizing Your Profit Margins," presented by Jimmy Lamb from Sawgrass Technologies; and a seminar on UV-LED printing titled, "Unlock Your Profit Potential with UV-LED Printing," presented by Steve Gluskin from Johnson Plastics Plus. Get all the details here: www.bit.ly/JPPMinnesota. ON THE MOVE A&E Two Freeman Worldwide Employees Join the Marco Awards Group Sales Team Marco Awards Group announced the addition of two Freeman Worldwide employees to its sales team: Gregory Kolenut and Erich Stock. Stock was named the Northeast Sales Manager, covering New York and New England. Kolenut was named the Freeman Acquisi- tion Manager and is responsible for all transition issues including product availability, pricing, and any Freeman product questions. GroupeSTAHL North America Appoints Gray as CEO GroupeSTAHL North America named Carleen Gray as the company's new CEO. Gray comes to the role with more than 20 years of experience in various positions at STAHLS'. Prior to her appointment, Gray served as executive vice president of sales and marketing and chief marketing officer at the company. In addition to her most recent roles, Gray holds more than 10 years as marketing director and a background in the automotive industry as a licensing manager for brands like Chrysler and General Motors. GSG Expands its Workforce Nationwide GSG expanded its workforce with new hires at multiple branch locations. New hires at the company include: Cookie Torres, embroidery service support specialist for GSG Dallas; Jamie Quinehan, sign territory manager for Minnesota, Wis- consin, North Dakota, and South Dakota; and Jim Szandzik, Cincinnati outside sign territory manager. In addition to new hires, GSG promoted Clark Lanius to GSG branch manager in Baton Rouge. Heat Transfer Warehouse Continues Order Fulfill- ment Team Development Tonya Venable joined Heat Transfer Warehouse as its newest order fulfillment specialist at the Fargo Warehouse. She is respon- sible for filling customer orders and helping convert material. Formerly, Venable was a Marine with over 20 years of administrative support experience.